This most recent take on Sabrina is a delightful concoction of the wholesome, coming-of-age, and chilling versions of the character. Sabrina The Teenage Witch has gone through a number of iterations in and out of comic books since her debut in 1962. From the wholesome, yet mischievous teen in 1960’s and 70’s cartoons, to the 90’s-era family/high school sitcom, to her darker turn in The Chilling Adventures of Sabrina. 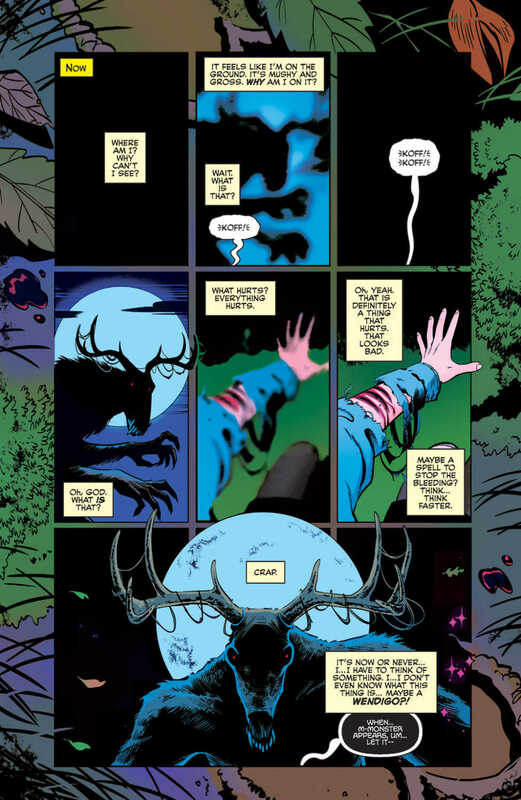 Much like superhero comics, Sabrina and her Archie counterparts have been able to endure for decades, changing with the times to reflect the culture of the era. The most recent take on Sabrina is a concoction of the versions the character and her world had taken for nearly sixty years. 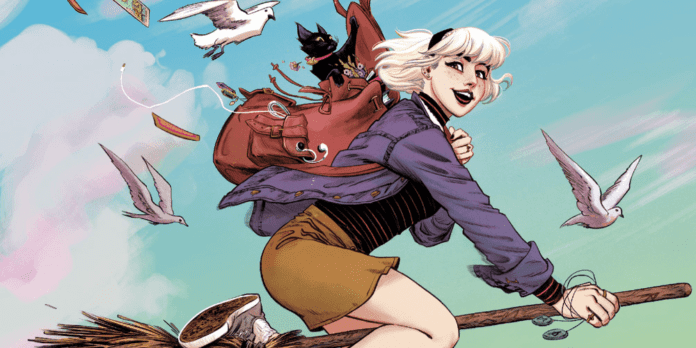 Sabrina the Teenage Witch #1 is very much an amalgam of the wholesomeness of the character’s debut, the family comedy and teen romance of the sitcom, and even a dose of the terrors from last year’s Chilling Adventures. Writer Kelly Thompson has successfully captured this in a single issue. The first page reads as if it will be another version of Chilling Adventures, when the next few pages shifts the tone and reads like a sitcom. We are treated to comedic banter between Sabrina and Salem, followed by an introduction to her Aunties Zelda and Hilda. Then we go along with Sabrina on her first day in a new school. There, she encounters potential friends, probable love interests, and definite bullies. This is all before the story returns to the situation Sabrina found herself in on the very first page. What Thompson has done exceptionally well is her use of Sabrina’s inner monologue. It is constantly going and filled with curiosity, sarcasm, confidence and angst. These are qualities most people identify with, particularly on their first day in a new school. Artists Veronica Fish and Andy Fish give the characters and world of Sabrina a quirky, yet somewhat grounded look. The illustrations are light and charming, but not overly cartoonish, like what is found in a classic Archie comic. The coloring also works well, with a bright, pastel palette. Those pages are contrasted by darker shades in the chilling moments that bookend the comic. 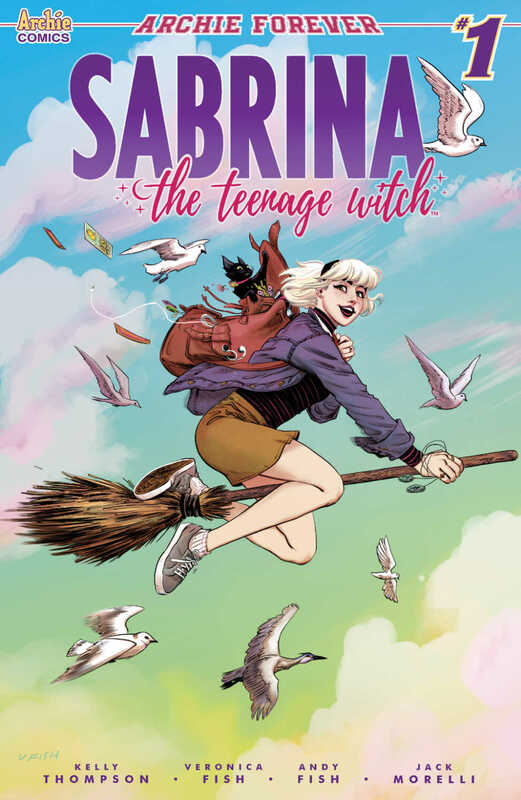 Sabrina The Teenage Witch #1 is a well-told reintroduction, blending sitcom humor, teen romance, high school drama, and a dash of horror. What did you think of Sabrina The Teenage Witch #1? Let us know in the comments!